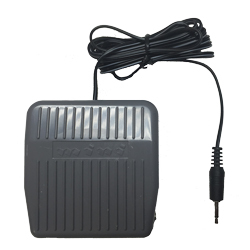 This cost-effective foot pedal is manufactured for Speech Recognition Solutions and works perfectly to control the microphone function in the SpeechWare 6-in-1 and 9-in-1 TableMike. This pedal comes with a 6 ft. cord, interfaces with the pedal jack on the 6-in-1 and 9-in-1 TableMike and based on the position of the switch on the bottom of your microphone base can be used in either a "Push-to-talk" method (microphone live only when depressing the pedal) or "push to lock" mode (cycle between microphone on and microphone off with each pedal depression. If you need more than a 6 ft. length, be sure to order the accessory 6 ft. audio extension cable. Comments: We bring this alternative to you mainly to provide a cost effective and functionally identical alternative. If you need extra cord length from the pedal to your computer, we recommend you purchase our 72 inch audio extension cable (see link below). If you have a SpeechWare 3-in-1 TableMike and want to control the microphone with a foot pedal, your only alternative is to purchase a USB foot pedal and Octopus USB Controller (OUC) to program the foot pedal. Both are available elsewhere on this site.